Prime Minister-in-waiting Gordon Brown offered former Lib Dem leader Lord Ashdown the Cabinet post of Northern Ireland secretary, the BBC has learned. Lord Ashdown said the offer was made on Wednesday - after Lib Dem Leader Sir Menzies Campbell said no member of his party would join Mr Brown's government. The peer said he was not in favour of the job and said he would not have gone for it without Sir Menzies' approval. Senior Lib Dems have angrily accused Mr Brown of "dirty underhand politics". Sources close to the Lib Dem leader accused supporters of Mr Brown of "trying to stitch us up... dump on us... divide us". They said Mr Brown's backers had deliberately gone behind Sir Menzies' back in an effort to "pick off" Lord Ashdown. Pensions Reform Minister James Purnell said it showed Mr Brown was "absolutely serious when he talks about a new kind of politics, an open kind of politics". But Conservative Shadow Foreign Secretary William Hague said: "There is nothing wrong trying to reach agreement across politics. I think this was a rather naive and bungled attempt to do so." He added: "A new kind of politics in this country is going to require some new politicians and that requires a change of government and David Cameron in as prime minister." BBC political editor Nick Robinson said a meeting on Monday between Sir Menzies and Mr Brown included discussions about junior roles for Lord Ashdown and another Lib Dem peer, Baroness Neuberger. 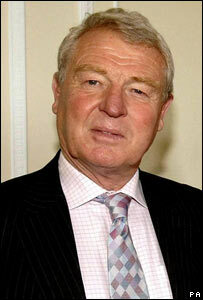 He said the Lib Dem leader had not been aware that a direct offer of a Cabinet post was being made to Lord Ashdown. It would have been unprecedented in modern times for a government with a clear majority, as Labour has, to give a Cabinet job to a member of another party. And the possibility of a Lib Dem sitting in a Labour Cabinet was ruled out by Sir Menzies Campbell's chief of staff Ed Davey. Mr Davey said they had rejected approaches from both Labour and the Conservatives, saying the Lib Dems were the "real" opposition on issues such as Iraq, council tax, nuclear power and tax breaks for the very rich. Education Secretary Alan Johnson, frontrunner to be Labour's next deputy leader, told the BBC he did not think a Liberal Democrat would sit in Cabinet for another 100 years. But, he said, Lord Ashdown had done a good job in Bosnia, where he was the UN High Representative until 2005 so "whether there is a specific job for him to do in government is another matter". Sir Menzies had ruled out any Lib Dem serving in a Brown Cabinet after Wednesday's Guardian newspaper reported Mr Brown was considering such an offer. Lord Ashdown revealed he had been offered the job on Wednesday in a statement to BBC Radio 4's Today programme: "It is true that Mr Brown suggested... that I might take a position in the Cabinet. "I told him that I could not conceivably consider such a position unless my leader told me that he thought it was a good idea and even if he did, I didn't." Is Brown's gambit audacious or inept? Lord Ashdown later told the BBC: "You do not build partnership government by seeking to add the Liberal Democrats as a bungalow annexe to a Labour government." It has been widely reported that Lord Ashdown and Sir Menzies Campbell were close to joining Tony Blair's first Cabinet when he came to power in 1997. The idea of Lib Dems sitting in a Labour Cabinet has always faced strong opposition among the faithful of both parties who are used to bitter political battles in local and national elections. Charles Kennedy, who succeeded Lord Ashdown as Lib Dem leader, swiftly distanced the party from any talk of coalition or deals with Labour. Lib Dem MP Phil Willis said he believed the offer was "mischief making" by Mr Brown.